Avent Interiors supply and install office partitioning in Bristol, Cheltenham and Swindon. They source their products from the leading manufacturers and meet the needs and budget of the client. 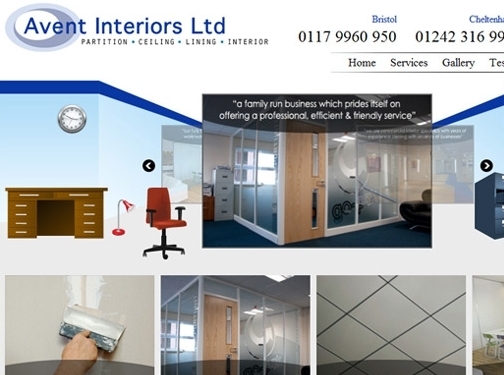 They undertake all types of office refurbishment services, so if you are looking for Suspended Ceilings in Swindon or Partitioning Services in Cheltenham, Avent Interiors can help. UK (Avon) based company offering a range of interior decorating services including dry lining, partitioning and suspended ceilings. Website features a photo gallery, testimonials, news section and full company contact details at the footer of each page.